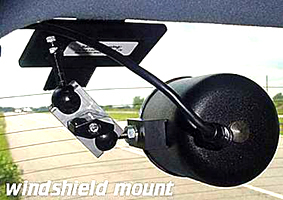 The speed radar antenna Dash Mount attaches to the dash of your vehicle using a very high-bonding foam tape. It allows the user to easily pull the traffic radar antenna from the mount and aim in any direction necessary, it then slides easily back into the mount and can be used with either an antenna or handheld unit. 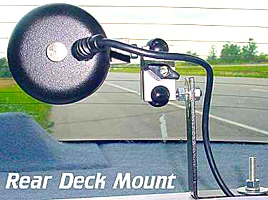 This traffic radar antenna mount easily sticks to any window but is used primarily as a windshield or rear window mount. It attaches with a very durable adhesive backed dual lock Velcro. 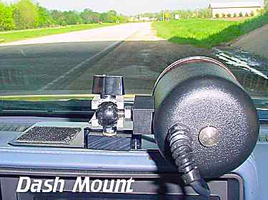 This speed radar mount attaches to the rear deck of the vehicle for a second antenna in the rear window to observe traffic going the opposite direction of the patrol vehicle. A hole must be drilled through the rear deck to attach this mount. 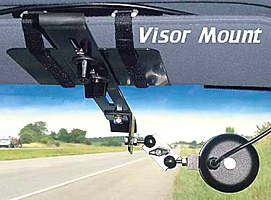 This traffic radar mount actually wraps around the passenger side sun visor and is held tight around the visor with adjustable Velcro straps. It is supported on the windshield with a small piece of dual lock Velcro. 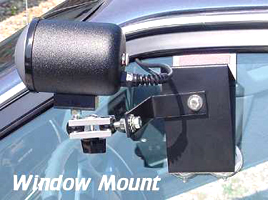 The Window Mount is easily attached to a side window inside or outside of the vehicle, it is held in place by simply rolling up the window, it also has suction cups for more stability.